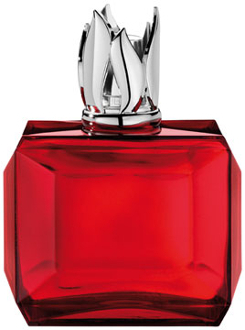 Lampe Berger's Carat lamp in heavy glass has always been a real favorite. This latest version in ruby red preserves the light reflecting characteristics of the earlier versions and adds the new flame top to complete the package. The lamp comes in a nice gift box with a burner, funnel and instructions. Height: 6.25"